Howard Davis asks, I'm curious about this notion of modules. Does the instructor who created the materials have control over how they're used? 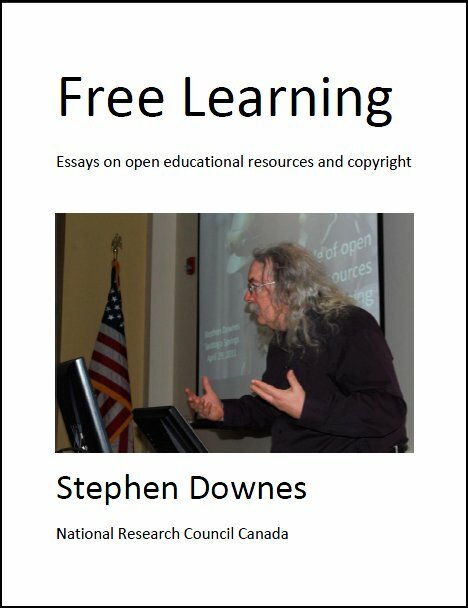 While I support flexibility and innovation in curriculum development, I'm wondering if increasing modularity of courses, and similar attempts at packaging, will not lead to (further) exploitation of instructors by schools caught in the rising tide of the commercialization of higher ed. Good question. It is certainly a subject which has come up among instructors here at the college. I'm going to address your question first by looking at the situation here, then by looking at some longer term objectives. The situation at Assiniboine now is one you won't particularly like (but there are many qualifications below). It is, simply, that instructors who create the material do not have control over how it's used. Before I remark further, I'd like to point out the preventing instructor exploitation is a major concern of mine. In designing my approach, I have kept this as one of my top priorities. There are pressures to allow exploitation, specifically: - I have been asked to design automatic delivery systems, focussing on multiple-choice answers - It has been suggested that with distance delivery a course could have only one instructor, many many students, and numerous "aides" - It has been suggested that pay scales for distance instructors be based on 'contact time' only, not allowing for preparation, etc. I'm sure many readers could report these and similar pressures. So it would look like the modularization of courses is one more tactic in the attempt to lower instructor pay. Let me turn to the other side of the issue. First, it is incorrect to state simply that course modules are created by instructors, for two reasons. First, course modules are generally created by a team. And second, course modules are composed of components which will almost always have different authors. Fred Smith, working with a designer and an HTML author, created a set of static pages on similar triangles. These static pages were originally for Math 23, but were found to be useful in other courses as well. Jill James is assigned to instruct the course. Prior to the start of the class, she opens her dynamic pages, adding notes and comments from her own point of view and specific to the class she is teaching. She adds another (review) link to the static data set on similar triangles, a link to the static data set on angles. As the class progress, students show they are not getting the concept. So she adds some short notes about similar triangles to her dynamic pages, and flags this with a 'What's New' message to the students. So: who created the module? Who should control ownership over how it is used? Clearly, in such a case, it would be arbitrary and unfair to give any one person control. Looking at it in this way, it should be clear that what was created by any given person is not in itself an instructional unit. Rather, it is a component of an instructional unit, a part of the whole. How these parts are created, and who uses them, vary depending on the part. The instructional matreials per se are contained in the static content. But a piece of static content resembles more a book or set of notes. Just as an author cannot determine how a textbook will be used (I use some texts to prop open doors, others to level my desk, and still others in class), so also it is unreasonable to expect an author of a static data set to determine how it is used. Similar comments could be made about module scaffoldings and even dynamic pages. But the issue isn't control over how something is used. Control over how it is used is a tool used to prevent authors' exploitation. The more significant issue is to prevent the authors' exploitation. But how to do this? First, looking again at the model described above, it should be clear that the instructor plays a central role. The model I describe is *not* one in which instructors are replaced by self-contained learning units. The reasoning for this is multi-fold; I'll sketch it very briefly: 1. Every class - and every student - is different. Attempting to design an educational model which suites all of them is not wise. A major part of the instructor's role is to mediate between the learning material and the particular individual needs of the class or student. 2. Communication, feedback and interaction are essential components of any learning situation. However, if a student is working with only a self-contained learning unit, then there is no communication. Second, at Assiniboine, we have also taken a more enlightened approach to distance educators' pay scales. Essentially, we have calculated how much work is involved for full-time campus-based instructors per student. We then assign that number of hours to a distance instructor on a per student basis, and pay them at the same hourly rate the on-campus instructor receives. The result is that, if the distance instructor teaches as many students as the on-campus instructor, the pay rates will be the same. This approach may need some fine tuning. For one thing, our instructors report that on-line instruction is quite labour intensive. We may need to adjust our time allocations for this. There are also some exceptions to this model at Assiniboine, due to factors outside my control. For example, in some cases, regular on-campus instructors are being assigned on-line courses. In such cases, the on-line class (which is about the same in size as an on-campus class) is calculated as a part of their normal workload, equivalent to one class. Third, exploitation is prevented by paying staff fairly for the materials they produce on behalf of the college. Often, we contract instructors specifically to create content. As the work is over-and-above their teaching duties, so also is pay over-and-above their regular pay. Alternatively, some instructors create content *instead* of teaching in class, for full pay. Looking even more long term, and on a wider scale, a new model is going to have to emerge. Let me explain why. In my opinion, the current model is *already* exploitative. But beyond that, there are several additional negative consequences to this model: - on the current model, it is better is materials are scarce. This allows for higher charges for use of the material, and in the end, more money for authors and publishers. However, this scarcity drives up the cost of education, having negative society-wide effects. It also restricts the flow of information. - on the current model, very few people can support themselves by producing content. Thus, the only people who can create content are people who are already well-salaried and who have the time to do it. For the most part, this means that content is produced by a small number of people, employed mainly at universities. - on the current model, more volume means more revenues. For example, it is better for an author to sell a $85 comprehensive text than it is to sell a $15 topic-specific paperback. As a result, it is not uncommon to see students and colleges purchase texts large parts of which will not be used. That said, with contemporary technology, the current model is unsustainable. This is because it will not be possible to maintain the scarcity of learning resources. The cost of obtaining these materials will be very low, because the cost of production and distribution have been sharply minimized. This is further exaggerated when the volume of a global market is taken into account. This is why, for example, Ziff-Davis University (ZDU - no, I'm sure they're not accredited) can offer very good computer courses for five dollars. Because they get so many registrants, the cost of producing and distributing the materials becomes almost negligible. How can the traditional suppliers react? By enforcing copyright? No way! ZDU produces its own materials. By restricting information flow? Not possible! 1. Academic Institutions and supporting agencies (such as textboook publishers) will have to focus on the fact that they are selling *services* and not *stuff*. This has always been true, but has been lost sight of recently. The reason why people pay tuition at Harvard rather than reading the CRC Handbook of Chemistry and Physics is that they want to receive the *service* of conversations with and feedback from the instructor. ZDU sells stuff, and sells it far cheaper than a traditional academic institution. But it doesn't sell *service*, which is why its prices are so low. 2. A new model for academic publishing will emerge. Academic texts or journal articles designed for only a few hundred readers (or thousands, if it's a major journal) will become a thing of the past. The reason for this is that, with so much information available, and available so cheaply, people will not pay inflated prices for material which they don't need or don't want. My articles, both published on my own web site and on list servers like this, receive far wider readership than any similar articles I could publish in a journal. The pay I receive for them is exactly the same: nil. Why would I spend time and effort writing to a restrictive (and expensive journal)? An objection which may be raised is this: that the *quality* control enforced by journal referees distinguishes them from on-line publishing. Well: first, I've read many journals, and many on-line articles, and quite frankly, the difference in quality is minimal. And second: another new industry emerging on the internet is refereed (moderated) discussion lists. DEOS-L is one, through the moderation on this list is very light. Others have a much higher rejection rate. These lists are valued resources - and I get them for free (they are supported by advertising). Taking this new model one step further: how will academic produce instructional materials in the future? Simply: they will produce static data sets. Moreover, static data sets need not be distributed on the internet alone. High-bandwidth static data sets may be pressed onto a CD-ROM and linked to in the same manner as a static data set resident on the internet. I can see the cost of a static data set being very low - on the $5 to $10 range. That's still more than authors get for journal articles. Poor static data sets will not return their authors a lot of cash. Good static data sets will return their authors a lot of money, because the market is so large. In summary, the development of a model something like this is inevitable because, in the current technological environment, information, once it is produced, may be replicated at negligible cost. Attempting to hang on to the production of information as an exclusively academic function is a tactic which will lead to much frustration, and ultimately, little satisfaction. Protecting academics from exploitation involves recognizing that they are performing a rare and valuable service, as opposed to being in possession of information other people do not have. The production of new information by academics will not result in itself in their getting rich, because the new information itself will decrease in value as it is widely distributed. Rather, the production of new information will result in that acadmic's *services* as a consultant, tutor or speaker being greatly in demand. Views Today: 0 Total: 212. Last Updated: Sept 15, 2018 11:03 a.m.